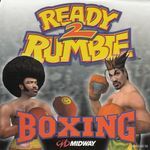 A comedic 3D boxing game featuring 17 wacky characters such as Afro Thunder and Lulu Valentine.The game features signature moves and Rumble Power. The more hits you make the more your Rumble Power Meter rises. Once full unleash your special moves to KO your opponent for good.